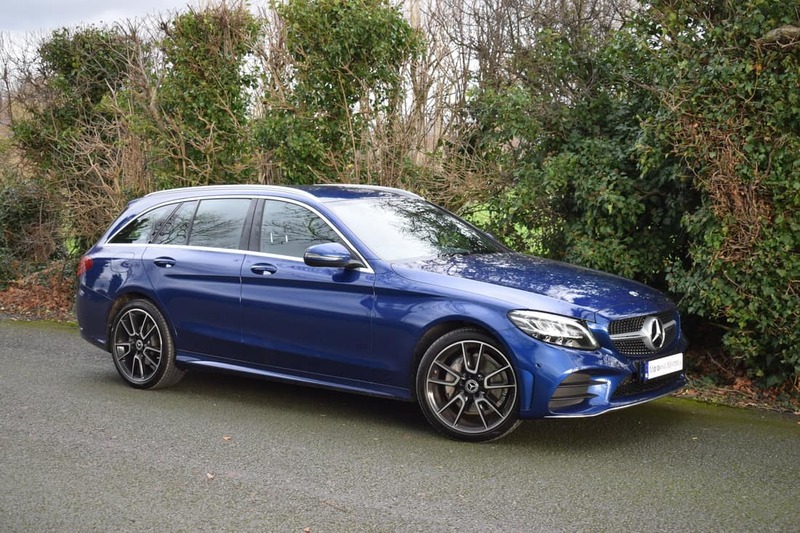 Estate of Grace – New Mercedes-Benz C-Class Estate AMG-Line Automatic. The sense of forward momentum in the new Mercedes-Benz C-Class Estate is plain to see. State-of-the-art, full-LED headlamps are more accurate, brighter and intelligent than ever before. They are just the beginning, and are immediately followed by new engines with optimal figures for efficiency. A fully digital cockpit, and the latest-generation assistance systems, bring the new C-Class Estate right up to date. So much is new, but one thing remains the same: the drive of the new C-Class to grow better, every day, with every journey. 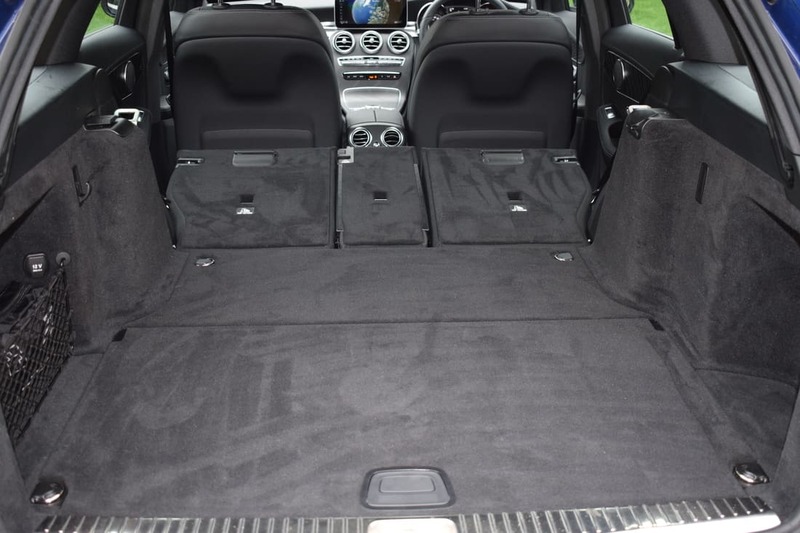 The new C-Class Estate continues the Mercedes-Benz tradition of producing desirable and luxurious load carriers, and is the company’s entry-level player in this sector. The car’s closest competitors are the BMW 3-Series Touring, Audi A4 Avant and the new Volvo V60. The C-Class was recently face-lifted, with new technical highlights added along with some new engines to keep it competitive. Although it plays second fiddle to the saloon from a popularity perspective, the Estate is still a hugely important member of the C-Class family – which also includes a sleek Coupe and a stunning Cabriolet. The German manufacturing giant’s focus with this recent facelift goes further than just skin deep. Design changes are relatively minimal, with the recognisable updates limited to a set of new headlights and subtly restyled bumpers. 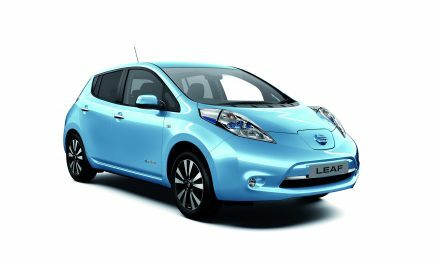 Instead, new technology and infotainment systems grab the headlines, alongside a host of new and improved engines. 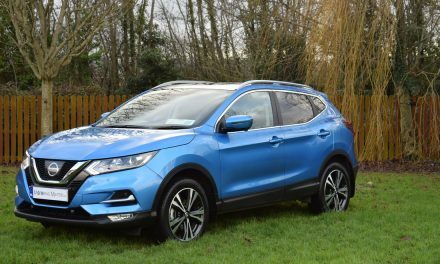 Engine choices comprise of petrol (from 1.5-litres to 4.0-litres in capacity and from 129bhp to 510bhp) and diesel (a 1.6-litre with 122bhp & 160bhp, and a 2.0-litre with 150bhp, 194bhp or 245bhp). 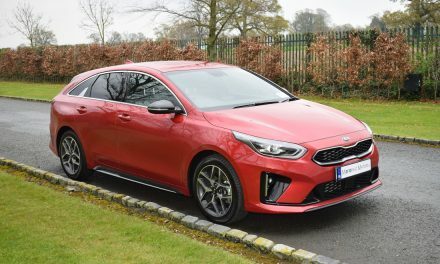 A six speed manual gearbox is available in the smaller capacity petrol and diesel engines, with a 9-speed (G-TRONIC) automatic gearbox standard from 2.0-litre engine size upwards. All models in the new C-Class Estate are rear-wheel-drive, but 4MATIC four-wheel-drive is optional – depending on the engine chosen. Trim levels in the new C-Class Estate are limited to just two – Avantgarde and AMG-Line. While the new C-Class Estate in Avantgarde specification is an extraordinarily expressive vehicle offering dynamism, comfort and safety, the dramatic styling of the AMG-Line lends the exterior of the C-Class a sporty, exclusive touch. As such you can make a clear statement for powerful design. 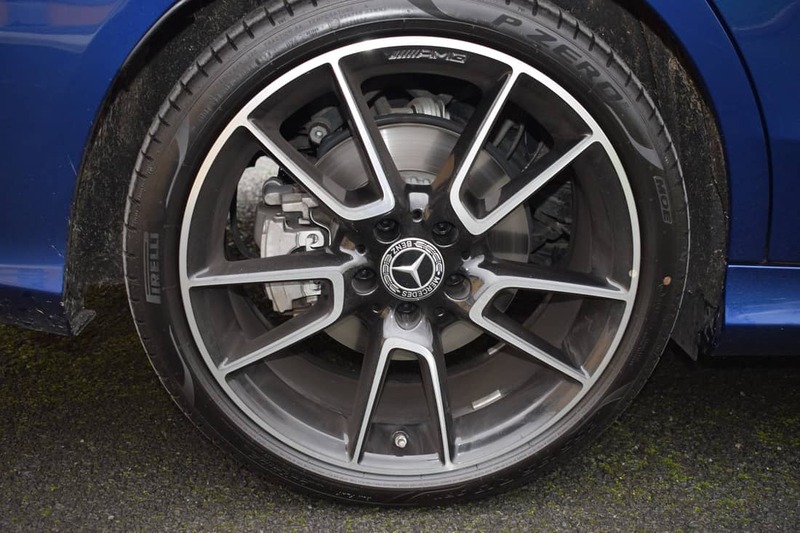 On top of this, the technical features give you profoundly more fun at the wheel, since the agile configuration of the suspension with Sports Direct-Steer results in markedly dynamic handling. 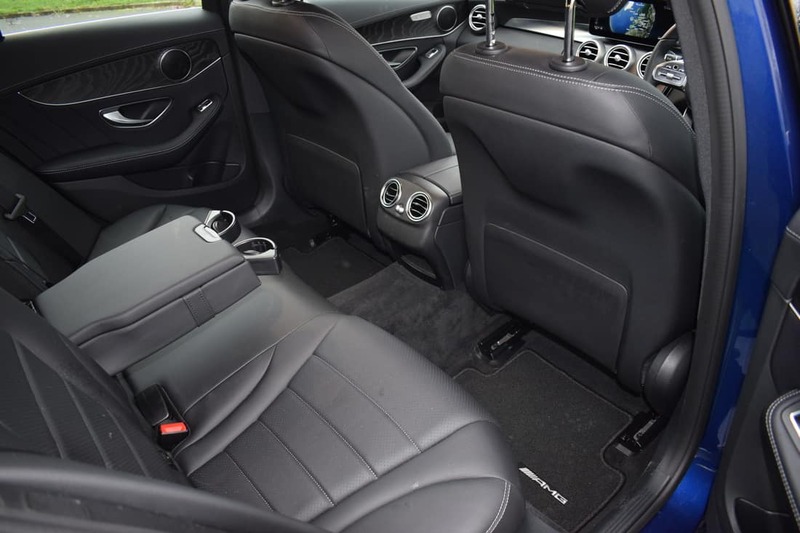 The AMG-Line interior adds to the vehicles sportiness, both visibly and tangibly. All C-Class models now have the three-pointed star logo incorporated into the grille rather than on the bonnet as Mercedes looks to modernise its biggest seller’s looks. The estate gets roof rails as standard, helping to create a more active lifestyle look for the estate model. 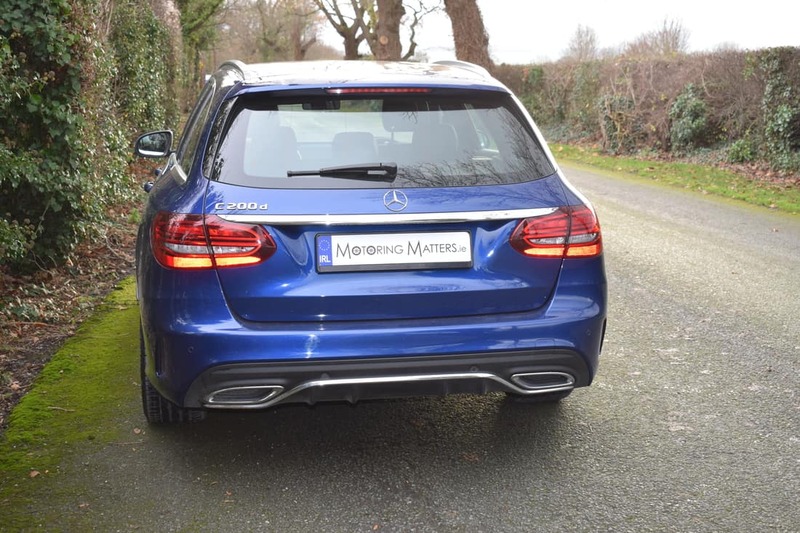 My test car was the new Mercedes-Benz C200d Estate Automatic in AMG-Line specification and was finished in Brilliant Blue metallic paint for maximum impact. The 1950cc turbo-diesel engine fitted to C200d produces 150bhp and a hefty 360Nm of torque, allowing the car to sprint from 0-100km/h in just 8.4-seconds, on its way to a top speed of 216km/h (where permitted). Fuel economy is teriffic, with my test car consuming as little as 4.7-litres of diesel for every 100kms driven on an extra-urban driving cycle. Thanks to an impressive Co2 emission figure of 132g/km, annual road tax is just €280. Standard specification across the new C-Class Estate range is impressive, with my AMG-Line test car coming with such standard features as sports seats in ARTICO upholstery with a Seat Comfort package, heated front seats, high-resolution media system with a 7” display, LED high-performance headlights, KEYLESS-GO starting function with turbine-look start/stop button, folding rear seat backrests, 3-spoke multifunction sports steering wheel in black nappa leather with a flattened lower section, reversing camera, light aluminium instrument panel trim elements, interior light package, AMG sports pedals, AMG bodystyling consisting of an AMG front apron with sporty air intakes and chrome trim elements, AMG diffuser-look rear apron with AMG side sill panels, diamond radiator grille with pins in chrome with an integrated Mercedes star, sports suspension with Sports Direct-Steer function, black fabric roof lining, black floor mats with AMG inscription, boot lid release switch in driver’s door (remote & electrically operated), perforated front brake discs, and front brake calipers with Mercedes-Benz lettering. The side view of the new C-Class Estate combines sporty style with generous sense of space. The so-called dropping line interacts with a counteracting line running rearwards from the front wheel to create exciting effects with light and shadows. 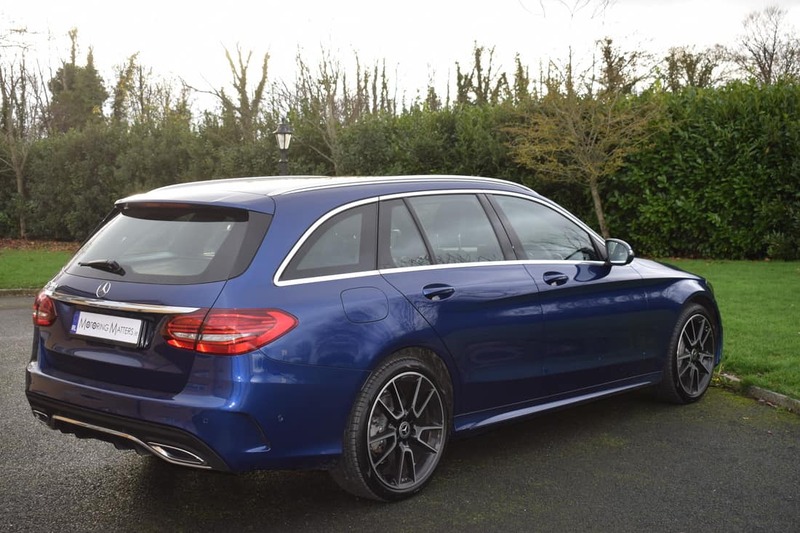 The slim and downward-tapering D-pillar gives the new C-Class Estate a particularly sporty flair. From behind the wheel, there’s little tangible difference between the saloon and the slightly heavier estate when it comes to dynamics. 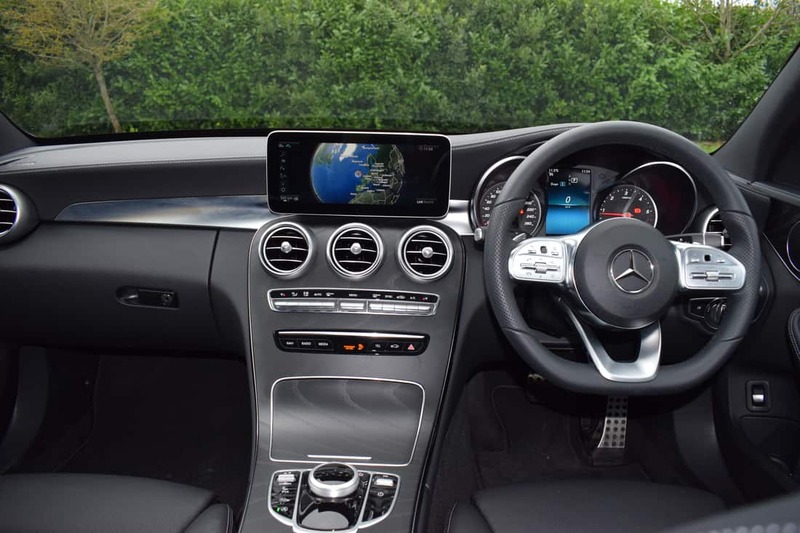 The C-Class is a safe, solid and direct car to drive with good body control. The new C-Class is more comfort-orientated than sporty, prioritising the ability to cover long distances in a relaxed manner, but it’s still sure-footed and composed enough to be entertaining on a quiet back-road run. The C-Class Estate’s suspension set up works really well, filtering out even the worst bumps and potholes, while providing a marked improvement in agility. A good driving position is easy to achieve too, thanks to excellent seat and steering wheel adjustment options. Cabin space in the new C-Class is impressive, with ample head, elbow and legroom allowing up to 5 adult occupants to travel in comfort. 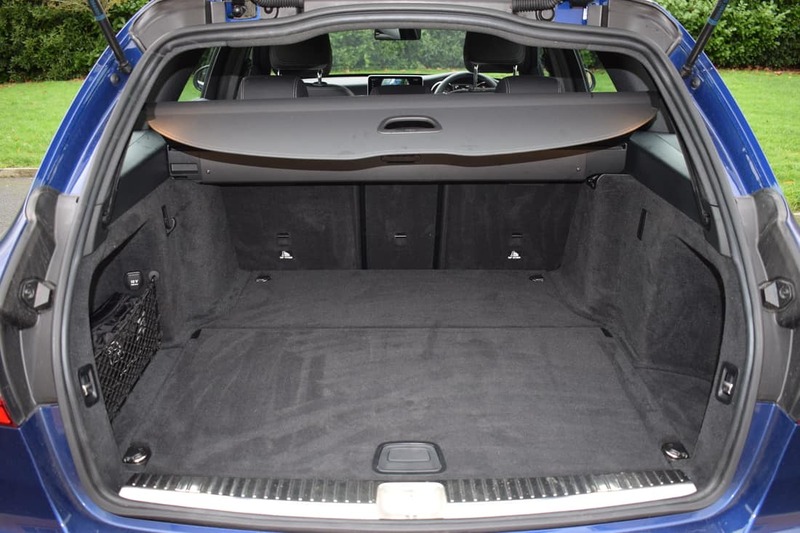 Boot space is equally impressive, with 490-litres available when the back seat rests are in place, and 1,510-litres when the split-folding rear seats are folded flat. The load bay is accessed through a wide-opening tailgate, while the electrically operated tailgate door adds a huge dose of practicality to the mix. 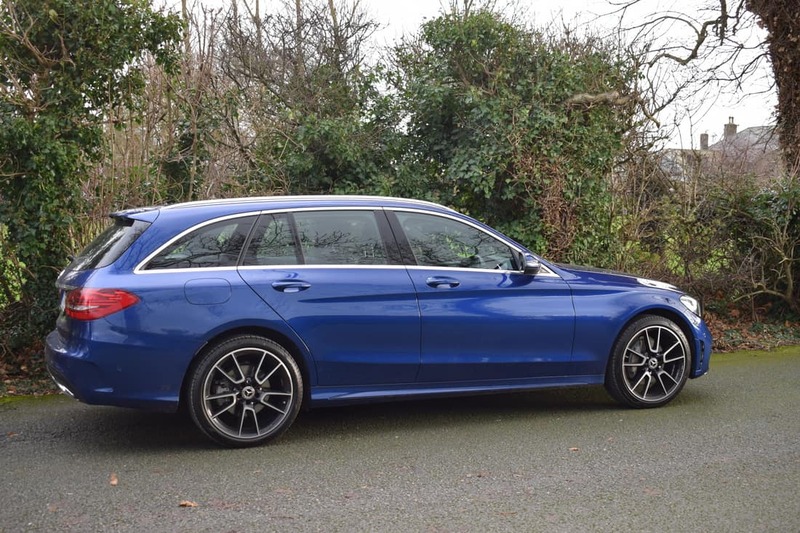 The new C-Class Estate is an easy car to recommend, thanks to its classy cabin, comfortable driving manners, effortless desirability and a good range of powerful-yet-efficient petrol and diesel engines – all of which makes it an excellent all-rounder. Ex-works prices for the new Mercedes-Benz C-Class Estate start at just €39,630, while my test car specification is priced at €45,710. 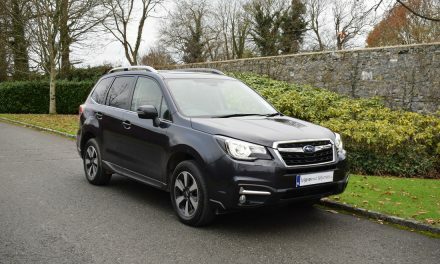 PreviousŠkoda Ireland Record Highest Ever Market Share in 2018. NextStunning New Mazda 6 Saloon – Redefining Expectations.